What is the Goal-Getting to the Moon First or Space. Preeminence? NASA’s budget request for FY1964 was $6.2 billion, including $4.6 bil­lion for the lunar landing program and $1.6 billion for all other NASA activ­ities. To keep the program on an “optimum” schedule aiming at a mid-1967 landing, Bell told the president, would require a supplementary appropriation of over $400 million in 1963 and about $550 million above the estimates for FY1964 made three months earlier. NASA’s recommended program aiming at a late 1967 landing would not require a FY1963 supplement, but would require the full $4.6 billion funding in FY1964. As Webb’s October 29 letter had indicated, advancing the target date to late 1966 would require a $900 million supplement and “create enormous additional management problems.” Bell noted that “in NASA’s view and ours” such a course of action “would not appear to offer enough assurance of actually advancing the date of a successful attempt to be worth the cost and other problems involved.” Bell also offered a lower cost option that would slip the landing target date to late 1968; that option would require $3.7 billion for the lunar landing program in FY1964 rather than $4.6 billion and was “significant as indicating probably about the lowest 1964 estimate under which the first actual manned lunar landing might still be expected to occur during this decade, after a realistic allowance for slippage.” Bell also reported that “our understanding of the latest intelligence estimates is that there is no evidence yet that the Russians are actually developing either a larger booster. . . or ren­dezvous techniques.” Thus “extreme measures to advance somewhat our own target dates may not be necessary to preserve a good possibility that we will be first.” This may have been one of the first warnings to President Kennedy that the race to the Moon he thought the United States was running may not have been a race at all. But as the November 21 meeting unfolded, it became clear that Kennedy was still in a race mentality. Kennedy: Do you think this [lunar landing] program is the top priority of the agency? Webb: No sir, I do not. I think it is one of the top priority programs. Kennedy: Jim, I think it is the top priority. I think we ought to have that very clear. Some of these other programs can slip six months, or nine months, and nothing strategic is going to happen. . . But this is important for political reasons, international political reasons. This is, whether we like it or not, in a sense a race. If we get second to the Moon, it’s nice, but it’s like being second any time. So if we’re second by six months because we didn’t give it the kind of priority [needed], then of course that would be very serious. So I think we have to take the view that this is top prior­ity with us. Kennedy: I would certainly not favor spending six or seven billion dollars to find out about space no matter how on the schedule we’re doing. . . Why are we spending seven million dollars on getting fresh water from salt water, when we’re spending seven billion dollars to find out about space? Obviously you wouldn’t put it on that priority except for the defense implications. And the second point is the fact that the Soviet Union has made this a test of the system. So that’s why we’re doing it. So I think we’ve got to take the view that this is the key program. . . Everything we do ought really to be tied to getting on the Moon ahead of the Russians. Webb: Why can’t it be tied to preeminence in space? Kennedy: Because, by God, we keep, we’ve been telling everybody we’re pre­eminent in space for five years and nobody believes it because they [the Soviets] have the booster and the satellite. . . We’re not going to settle the four hundred million this morning. . . But I do think we ought to get it, you know, really clear that the policy ought to be that this is the top prior­ity program of the agency, and one of the two things, except for defense, the top priority of the United States government. I think that is the position we ought to take. because I’m not that interested in space. I think it’s good, I think we ought to know about it, we’re ready to spend reasonable amounts of money. But we’re talking about these fantastic expenditures which wreck our budget and all these other domestic programs and the only justification for it in my opinion to do it in this time or fashion is because we hope to beat them and demonstrate that starting behind, as we did by a couple of years, by God, we passed them. Even before this January exchange of correspondence, as the final bud­get decisions for Fiscal Year 1964 were made by the president and BOB in December 1963, any thought of a supplemental request for FY1963 were abandoned, reluctantly on the president’s part. Kennedy had once again accepted the position of NASA administrator Webb on how best to go for­ward. Indeed, BOB made reductions in both the lunar landing budget and the “other activities” portion of the NASA request. The president in mid – January 1963 sent a FY1964 budget proposal to the Congress requesting $5.712 billion for NASA, an almost half-billion dollar cut from what NASA had requested in September. Although the increase was not what NASA had hoped for, it still reflected a 55 percent jump over NASA’s FY1963 appro­priation. During 1963, John Kennedy was no longer totally focused on how soon the United States could get to the Moon; he seemed in fact to have accepted NASA’s argument that preeminence in all areas of space activity was the more appropriate goal. In addition, at least some of the president’s associ­ates, and perhaps Kennedy himself, questioned whether getting to the Moon before the Soviet Union remained a compelling national objective. Indeed, Kennedy asked, might it be both desirable and feasible to cooperate, rather than compete, with the Soviet Union in humanity’s first journeys beyond Earth orbit? John Kennedy had brought with him the idea that space might be a particularly promising arena for tension-reducing U. S.-Soviet coopera­tion as he entered the White House in January 1961, and it had never totally disappeared from his thinking. 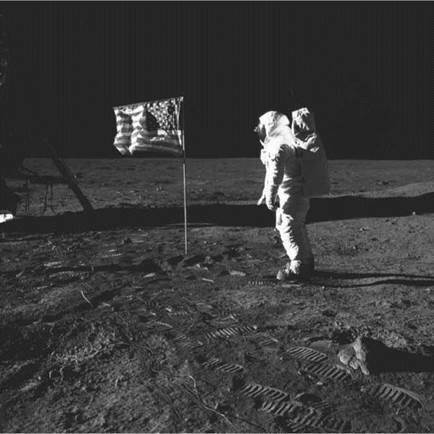 Apollo 11 astronaut Buzz Aldrin and the U. S. flag on the lunar surface, July 20, 1969 (NASA photograph). surface, in terms of its impact on the evolution of the U. S. space program since the end of Project Apollo, and in terms of how humanity’s first jour­neys beyond the immediate vicinity of their home planet will be viewed in the long sweep of history. The Air Force push for a larger role in space had continued after the Kennedy administration came into office; the major aerospace trade magazine Missiles and Rockets reported late in March 1961 that “the showdown on who will take charge of the U. S. man-in-space program—and with it the main role in space exploration” would come soon, and that in the choice between NASA and the Air Force, “the best bet on who will win when the cards are dealt: the Air Force.”23 By the time this report appeared, however, Air Force ambi­tions had been significantly tempered by both the president and the new managers of the Department of Defense. After helping prepare the Webb-McNamara report over the May 6-7 week­end, Willis Shapley found himself in charge of carrying out a review of that report from the BOB perspective. The draft of the internal BOB review was completed on May 18, and BOB director Bell sent it to Secretary of Defense McNamara, NASA administrator Webb, and Atomic Energy Commission chairman Glenn Seaborg with a request for immediate comments. Welsh of the Space Council also received a copy in the absence of Vice President Johnson, who was still touring in Asia. The final version of the review was dated May 20. 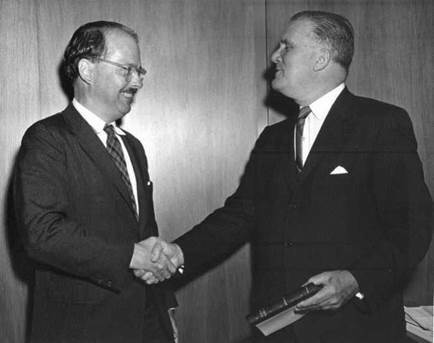 James Webb with Willis H. Shapley (on left), the Bureau of the Budget staff person who played a key role in space decisions during the Kennedy administration (NASA photo). Whether President Kennedy or his closest advisers read the BOB analysis cannot be known with certainty. If they did read it, they would have had the benefit of a comprehensive and thoughtful analysis of the implications of the decisions that Kennedy was about to announce. Mid-1963 developments—improved U. S.-Soviet relations, growing criti­cisms of the U. S. Moon program, White House concerns about its costs, and possible signals of Soviet openness to collaboration—formed the back­ground against which President Kennedy decided in September 1963 to include a suggestion of U. S.-Soviet cooperation in going to the Moon in his September 20 address before the United Nations General Assembly. Whether or not Kennedy had ever given up on the idea of such cooperation during the difficult days of 1961 and 1962, the changed situation in 1963 made him again interested in actively pursuing the idea. As noted above, in his July 17 press conference, Kennedy for the first time had publicly stated his preference for a cooperative approach to lunar exploration. Speechwriter Arthur Schlesinger, Jr., may not have been aware of these presidential initiatives and conversations when he inserted language pro­posing a joint U. S.-Soviet moon mission in his draft of the UN address, although it is hard to conclude that he independently came up with the same idea. But there is no doubt that the concept had been widely discussed by President Kennedy and others between July and September 1963. States was trailing the Soviet Union in space achievement was frequently cited by Kennedy as very visible evidence of this disparity. Kennedy offered no specific views on future space activities during the campaign, however, and once he was declared the president-elect, he spent little time on space issues prior to his inauguration. This meant that Kennedy’s personal views and interests with respect to space, as differentiated from his campaign rhet­oric, remained largely unknown as he entered the White House. In the weeks after his inauguration, President Kennedy spent very little time in formal consideration of space issues. On February 13, he sent Soviet pre­mier Nikita Khrushchev a congratulatory note on the launch of a Russian mission to Venus on the preceding day. (After returning data during its interplanetary cruise, the Venera 1 mission ultimately was a failure in achiev­ing its primary objective of returning data from Venus.) Later that same day, Kennedy met with Overton Brooks, chairman of the House Committee on Science and Astronautics, who told Kennedy that “NASA and the civilian space program badly need a shot in the arm.” Brooks said that Congress, or at least his committee, “cannot impress upon the Executive too strongly the need for urgency” in the space program, for “if we do not recognize it, we may falter badly in both our domestic and international relationships.”15 Science adviser Wiesner at some point after the Russian Venus launch discussed with the president the implications of the launch and “our relative positions in the general fields of space exploration and science.” The launch had raised security concerns because specialists at the Central Intelligence Agency had suggested that it could be “a step towards creating a capability for achieving a parking orbit with an ICBM warhead”; the spacecraft had in fact gone into orbit around the Earth before ejecting a large probe on a Venus-bound trajectory. The sample questions and answers used in preparing Kennedy for a February 15 press conference suggested that, if asked about the military significance of the launch, he reply that “there is no indication that the Soviet Union plans to use their ability to orbit large payloads to develop any kind of bombardment systems.” Such a system would be “inef­ficient” and would likely “be objected to by all the nations of the world.”16 In a follow-up memorandum to his discussion with the president, Wiesner noted that “the most significant factor, as we have said many times, is that the Soviets have developed a rocket as part of their ballistic missile program with considerably more thrust or lifting power than anything we have avail­able.” He noted that “one of the things we must realize is that in dramatizing the space race we are playing into the Soviet’s strongest suit. They are using this accomplishment at home and around the world to prove the superiority of Soviet science and technology.” Wiesner told the president that the United States “was superior in most fields to Soviet science” and that “in almost any other area in which we would elect to compete, food, housing, recreation, medical research, basic technological competence, general consumer good production, etc., they would look very bad.” He suggested that “we should attempt to point this out rather than assist them by an official. . . reaction that supports their propaganda.”17 Subsequent actions by President Kennedy demonstrated that he did not accept this advice. The second reason for the delay in selecting a launch vehicle for the lunar mission was NASA’s difficulties during the May-November period in decid­ing its preferred approach to sending men to the Moon.24 Indeed, this uncer­tainty would continue well into 1962 and become a focus of NASA-White House controversy. Beginning on May 2, even before a final decision on whether to approve a lunar landing effort had been made, there were a series of NASA stud­ies examining alternatives for accomplishing the lunar mission. The first of these studies took as its starting point a “direct ascent” approach, in which the spacecraft for the lunar mission would be launched by a giant booster with eight F-1 engines in its first stage. The spacecraft would fly directly to the Moon and land intact on the lunar surface. A portion of the spacecraft would then take off from the Moon after the astronauts had completed their exploration, and return directly to Earth. This approach meant designing a seventy-five-ton spacecraft, almost forty times the weight of the Mercury cap­sule, that would “back down” to a lunar landing, using rocket firings to slow the craft to landing speed; during the landing, the astronauts would be on their backs at the other end of the craft, more than eighty feet above the sur­face and with no or very limited direct visibility of the landing site. The direct ascent approach also required that the fuel for the return journey and the heat shield needed for reentry into the Earth’s atmosphere, both of which were heavy, would have to be carried to and then launched from the lunar surface. All of this would require a large and heavy spacecraft, and thus a very power­ful booster NASA called Nova to send it to the Moon in a single launch. The more NASA, and especially von Braun and his team at Huntsville, thought about the technological leap required to develop the gigantic Nova vehicle, the more it looked for alternatives to making such a jump. NASA during the summer of 1961 began to look harder at an approach called Earth-orbit rendezvous (EOR). This approach would allow the lunar spacecraft and the rocket stage needed to send it toward the Moon to be divided into two or more pieces, each piece launched separately. One or more rendezvous in Earth orbit would then be needed to assemble the pieces into a single spacecraft. An alternative EOR approach was to send the complete spacecraft and its Earth departure stage fueled with light liquid hydrogen into Earth orbit with one launch. Then a second launch would carry into orbit the comparatively heavy liquid oxygen used as the oxidizer for burn­ing the hydrogen fuel; the oxygen would then be transferred to the lunar – bound rocket stage. Using an EOR approach meant that a launch vehicle significantly smaller than the Nova could be developed for the lunar mission. However, it did not solve the problem of how to land a single large spacecraft on the lunar surface. 1. What are the salient differences. . . between the NASA program projected on January 1, 1961 for the years 1962 through 1970, and the NASA program as redefined by the present Administration? 2. What specifically are the principal benefits to the national economy we can expect to accrue from the present, greatly augmented program in the following areas: scientific knowledge; industrial productivity; education, at various levels beginning with high school; and military technology? 3. What are some of the major problems likely to result from continuation of the national space program as now projected in the fields of industry, government, and education? 4. To what extent could the program be reduced, beginning with FY1964, in areas not directly affecting the Apollo program (and therefore not compromising the timetable for the first manned lunar landing)? The Space Council’s Edward Welsh led the process of getting inputs from the council’s member agencies. He received brief papers from staff officials at the Atomic Energy Commission (AEC) and the Department of State, a one – page letter with supporting material from Jerome Wiesner, and a seven-page response from Secretary of Defense Robert McNamara. NASA’s James Webb first sent a four-page cover letter with a sixty-three page attachment; this was later reduced to a seventeen-page memo signed by Webb; it still had ten pages of attachments. Webb was as verbose in his written communications as when he spoke. benefit or of military development. . . A much more fundamental issue is at stake—whether a dimension that well can dominate history for the next few centuries will be devoted to the social system of freedom or controlled by the social system of communism. Although President Kennedy requested that an unclassified version of the Space Council report be prepared, it was not publicly released or referred to in the continuing debate over space priorities. While Kennedy himself remained publicly committed to proceeding with the accelerated space pro­gram he had endorsed in May 1961, the questioning of the program’s values and implementation by his senior staff suggested not only that was there a public debate over the proper goals and pace of the space program, but also that a similar debate was beginning to take place inside the top levels of the Kennedy administration. This disparity in satellite-lifting capability was the by-product of the dif­ficulty the Soviet Union had several years earlier in designing a warhead for an ICBM launch. The three megaton nuclear warhead which was the payload for the R-7 ICBM weighed approximately 11,000 pounds, thus requiring the development of a powerful booster to send it on its intercontinental trajec­tory. By contrast, the United States a few years later was able to develop a thermonuclear warhead weighing only around 1,600 pounds; this meant that U. S. Atlas and Titan ICBMs did not have to be nearly as powerful as the Soviet R-7 in order to accomplish their military mission. This was accept­able in terms of strategic rocket relationships, but meant that the United States was at a severe disadvantage in sending heavy payloads into space. The United States might be able to launch scientifically sophisticated satellites, but it would not be able to match the Soviet Union in publicly visible space achievements using a converted ICBM as a launch vehicle. However, the Bureau of the Budget (BOB) was determined that the bud­get to be submitted by Dwight Eisenhower a few days before he left office in January 1961 would be balanced, and this determination took priority over Eisenhower’s support for accelerating the Saturn program. NASA had hoped to get a FY1962 budget of $1.4 billion approved; such a budget would have enabled NASA to accelerate its booster and rocket engine development efforts. After tough negotiations with BOB, NASA was held to a $1.1 billion total.36 At that budget level, there would necessarily be a delay in closing the weight-lifting gap with the Soviet Union. It would be up to the new presi­dent to decide whether this was an acceptable situation.